Getting bored with the same old Sriracha Sauce? Ready to take Sriracha on a whole new Scoville level? Or do you just need some hot sauce in a pinch? Here I laid out a delicious, beautiful, extremely hot and spicy Homemade Habanero Sriracha sauce. Seriously, this sauce is not for sissies. 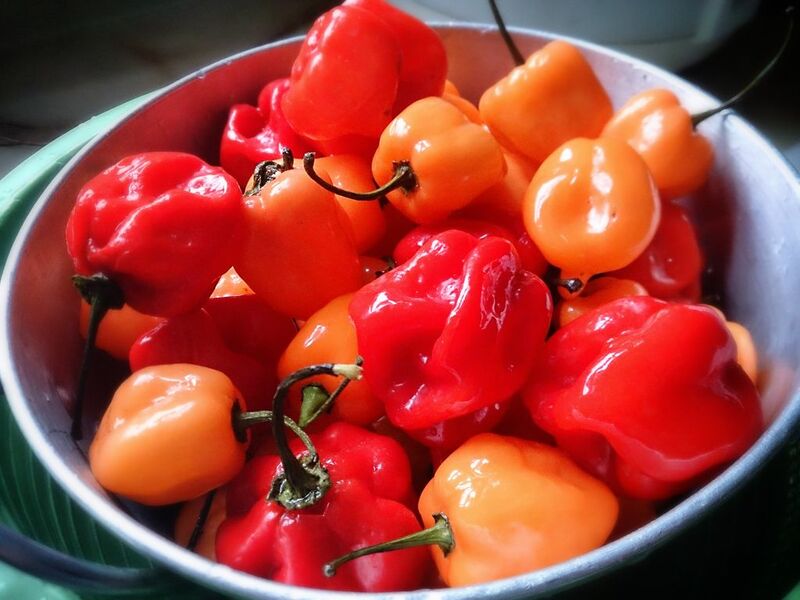 Clean the Habanero Peppers by washing them under running water in a Colander and Drain. Roughly Chop Peppers and Garlic just to make it easier to blend. Habaneros are ridiculously hot (100,000 to 350,000 on the Scoville Scale), so removing some of the seeds and the white membrane inside the habaneros can kick back some of the heat. For my sauce, I just removed half the seeds from the peppers by running the inside of the peppers with cold water. Put the chopped peppers, and garlic into the blender. Pour 1/2 Cup of Water and Apple Cider Vinegar into the blender as well. I like using Apple Cider Vinegar, because it adds more of a fruity flavor to the sauce that complements the Habanero. It also helps darken the sauce a bit to make it similar to regular store bought Sriracha Sauce, but you can always use White Distilled Vinegar if you want. Blend for 5 minutes, until everything is a smooth puree. Pour the mixture into a saucepan on medium heat. Wait till the mixture comes to a low simmer. Slowly stir in a 1/4 cup of sugar till it dissolves. I used Sugar in the Raw, because that's what I prefer. Most people use brown sugar to deepen the flavor in their Sriracha sauces, but any kind of sugar here is fine. Simmer for 20 minutes or till the mixture reduces by 1/3. Skim off any foam that collects on the top, and discard foam. Pour reduced sauce into the blender again, and let it cool down for a few minutes. Blend for another 5 minutes to further break down the warmed peppers. Push the mixture through with a spoon to drain all that hot sauce till all that's left is dry pulp and seeds. If the mixture at this stage is still not the consistency you want. You can add more water and vinegar to thin it out, or reduce further on a saucepan on low heat to thicken it up. Most recipes call for Sriracha to be fermented for a few days, but I didn't see any need for it. You're welcome to try though. This homemade Habanero Sriracha sauce is way more hotter than usual store bought Sriracha, but it's still really good. It has the same texture, the garlic-y, sweet and sour notes of regular Sriracha sauce, but has a brighter, more vibrant, and fresher color and taste. The habaneros add a slightly more fruity, and citrus notes, but use it like regular Sriracha sauce, and you will not be disappointed. That is, If you still have your tastebuds left after trying some. This should hold for about 5-6 months. I'm growing 30 types of peppers this year, but only the Fresnos are ripe enough to pick now. So, my first batch will use Fresno peppers. I use a Vitamix, which can pulverize all pulp and seeds into a fine puree. I usually leave the actual seeds out as I think they impart a bit of bitterness, and the heat is in the membrane anyway. So, I would like to skip the sieve process, as there would be nothing to 'catch' anyway. For a sweetener, I prefer to use honey. I assume the same proportion would work. For the vinegar, I will use Bragg's Organic Apple Cider Vinegar. Would you suggest any changes in amounts with my ideas? Any other thoughts? I think the honey may change the consistency of the sriracha a bit, but during the reduction and reblend it should be ok. Bragg's is an awesome choice for vinegar! OK Here I Go! I only have 11 oz. Habaneros, I do have some Tabasco, Cayenne or Serrano's that I could add, but then it wouldn't be Habanero sauce would it. I'll just cut the recipe in half. Do you think this recipe would also work for the other peppers I have? of course! add whatever fruit or peppers you want to make it your own. Hi cuongpluu, with "1 1/2" pounds Habaneros do you mean "one and a half"? Because I'm, doing the recipe and with this quantity (equivalent to about 600 grams), the 1/2 cups of water and vinegar are too small to provide a liquid mixture like the one in your pictures. I had to put in 1 cup and a half each of water and vinegar to make it work. Haha. Yes, I guess there are a lot of people who like it extra garlicy! It's all good! I did use one and a half pounds of habaneros though which should equal to about 680g. A half cup of water and vinegar should be 120g for each, or 240g for a cup of water and vinegar together. I hope that helps! this sounds REAL tasty ! Any suggestions for zero-processed/simple-carb, zero-chemical sweeteners for this? Stewed apples or onions, perhaps? Stewed, and mushed up apples would be a great way to sweeten it up, but I'd definitely would also increase the garlic to balance everything! I'd probably use honey personally if I had to use a natural sweetener though! Thanks guys! I'll look into those. I would try carrots and mangos for a natural sweetness, it's what my brother uses when he makes ghost pepper carrot mango sauce, sorry no clue on amounts.. I would like to make this for my husband. I grew habaneros in my garden last year and dehydrated that crop. How would I go about making this recipe using my dehydrated habaneros? Ah, I'd definitely rehydrate the habaneros in boiling water for a bit, then add a bit of a neutral oil like grapeseed oil to the blender to help it pureee, and continue on with the recipe. I hope this helps! Instead of using gloves, you can rub cooking oil over your hands. The oil will prevent the capcasin from getting into your pores and making your hands burn. It also, of course, makes your hands slippery so if you're not that skilled with a knife the gloves may be the better choice. oh! that's a good idea, I actually never heard of doing that! That could come in handy one day, unfortunately I don't trust myself enough to cut things with oily hands. Haha.